accepting help… | maya c.
When I was 18, I left home. With fiery abruptness, I started my independent life. Work, school, survival… somehow I managed on my own. In hindsight, that time in my life makes perfect sense. I was always fiercely independent. I’ve had some sort of income since I was ten. I walked myself to school in Greece when I was four. At six or seven, I decided to leave our seventh storey apartment, walk a few major blocks across big intersections to Kmart to buy my mom a gift – a fancy mug. Needless to say, my resourcefulness was often the cause of much worry and drama. Age 3. I made myself lunch. 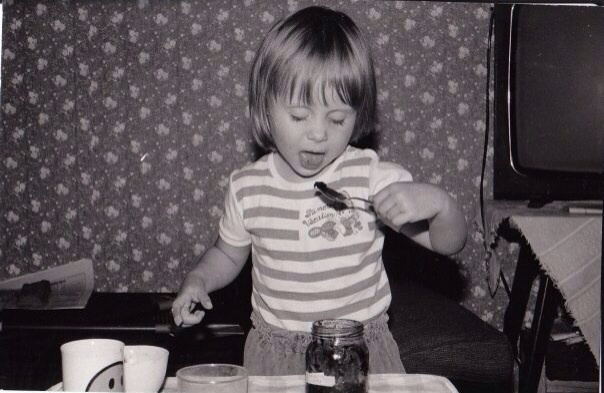 Note the back-up spoon in my right hand. This unyielding independence has made it extremely difficult for me to ever accept help and I’d certainly never ask for it. It always seemed like a sign of weakness… until now. We have survived the last few weeks with Ryan thanks to the grandmas who held him until the wee hours of the morning, the aunties who dropped everything when Matt was sick to provide an extra set of hands, the grandpas who bought groceries and fixed pipes, the friends who dropped meals on our porch like sneaky little mice… We needed help and we got it. One – My doctor told me to stop squandering the help I’m being offered and try being grateful instead. Ouch. Amen! When people say, “let me know if there’s anything I can do,” you have to say ,”You can do X.” Baby rearing was not meant to be done in the insular, nuclear households that are typical of our society–it’s just impossible! So you have to summon your village!